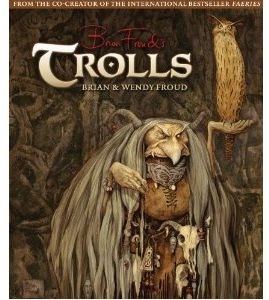 You are here: Home » MEDIA » Books » Trolls by Brian and Wendy Froud (art-book review). Although I’m not a lover of fantasy, I do like Brian Froud’s illustrative work. He explains in the introduction to this book, ‘Trolls’, that the work presented here would have gone towards a further film with producer-director Jim Henson had he lived so this book is some twenty years in the making. I also discovered that the Frouds live one county down from where I live, which might explain some familiarity with the surroundings he sees the trolls in. Devon is a pretty and wild-looking county and if you’ve ever seen the likes of Exmoor, Bodmin and Dartmoor, you would believe that around any stone, a troll could pop up and surprise you when deprived of human habitat. 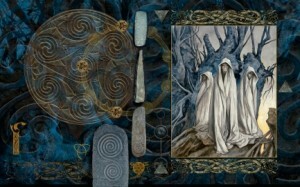 Combined with Brian’s artwork is his wife, Wendy’s stories and poetry. ‘The Troll Bride’ illustrates the problems of a human marrying one and discloses a fact about their backs that I didn’t know about before. Before you ask, not all trolls start off looking, how shall we say, earthen ugly to the eye of the human beholder, and is understandable why you could fall in love with one. ‘The Tale Of Bone: The Red-Haired Boy’ is more an extended story and mystery, showing how trolls will let humans into their kingdom but will seek retribution for any abuse to their generosity. 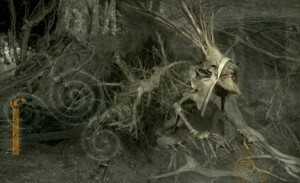 Until now, I didn’t even realise trolls could be generous to humans but that might be the bad reputation made by those that live under bridges. Even so, this story has an interesting twist to it for all that. 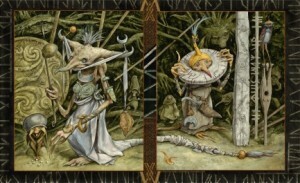 © 2012 Brian Froud and the book: Trolls by Brian & Wendy Froud is published by Abrams. 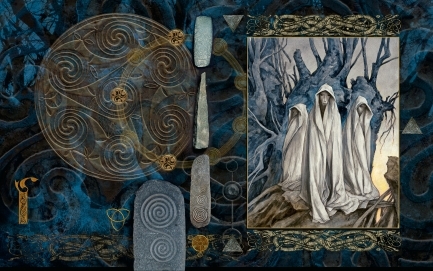 Being reminded of trolls affiliation with bridges makes me wonder if the Frouds have ever visited Tar Steps? To those of you who’ve never been to my end of the UK, this is part of Devon that we locals call ‘Lorna Doone’ country but equally belongs to trolls. You could well believe the trolls are waiting and watching there as well. I would recommend you keeping an eye on your spoons when you picnic, as trolls like collecting them. One thing this book does reveal is that there isn’t just one type of troll but they can come in a variety of sizes, often growing from one to another and even different types, as witnessed by those who can play musical chairs, without music and chairs, and literally using their heads. This is a fun coffee-table sized book that should amuse adults and older children alike. I think the very young kids might get a little skittish with what some of these trolls can do. The art and model-work is a joy to the eye, with the Frouds catching the cheeky glimpse in the young trolls eyes as well as the world-weariness in the older adults. If you can’t visit their kingdom, then this book makes for a tantalising choice. Excuse me now, I have to see a troll about a missing tail.